General Hospital (GH) spoilers tease that a day of despair is coming up in Port Charles. 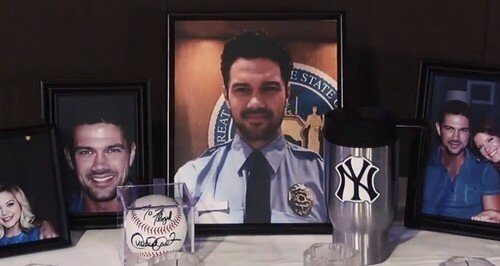 GH fans know Nathan (Ryan Paevey) recently died following a gunshot wound. Faison (Anders Hove) killed his own son before he faced the same fate. Nathan’s loved ones are glad Faison paid the ultimate price, but that won’t do much to ease their suffering. The funeral is looming and it’s bound to be brutal. Nathan’s friends, family members and coworkers will all gather for this event on Friday. As Nathan’s casket is carried by all the mourners, the tears will start flowing. This will barely seem real to those closest to Nathan. Maxie (Kirsten Storms) will still feel like she’s stuck in a cruel nightmare. Nina (Michelle Stafford) and Dr. Obrecht (Kathleen Gati) will certainly struggle as well. GH viewers will hear some heartfelt speeches during this crushing episode. Dante (Dominic Zamprogna) might say a few words about his beloved pal. Nathan was a like a brother to Dante. They always had each other’s backs, but it’s time to let go. Dante will do his best to stay strong for Lulu’s (Emme Rylan) sake. She’ll be filled with remorse over the interview that sparked deadly danger. While Valentin (James Patrick Stuart) comforts Nina, Franco (Roger Howarth) will have a chat with Dr. O. General Hospital spoilers reveal that Franco will provide a pep talk. He’ll know there’s nothing he could say to make the pain go away, but just being there for Dr. Obrecht should help. Any support is appreciated right now. As for Maxie, there’ll be plenty of people waiting to offer sympathy. Unfortunately, this may be something Maxie has to work through on her own. She used to rely on Nathan when things got tough. Now Maxie will feel like she’s alone in this fight. She’ll have trouble getting through Nathan’s weepy memorial service. However, the hardest part is still to come. After white roses are placed atop Nathan’s casket, the funeral will wrap up. General Hospital spoilers state that Maxie will want a moment to herself. She’ll stand over the coffin just before Nathan’s burial. Maxie will wonder how she’s supposed to say goodbye. GH fans will want to tune in for these emotional scenes. We’ll give you updates as other news comes in. Stick with the ABC soap and don’t forget to check CDL often for the latest General Hospital spoilers, updates and news.